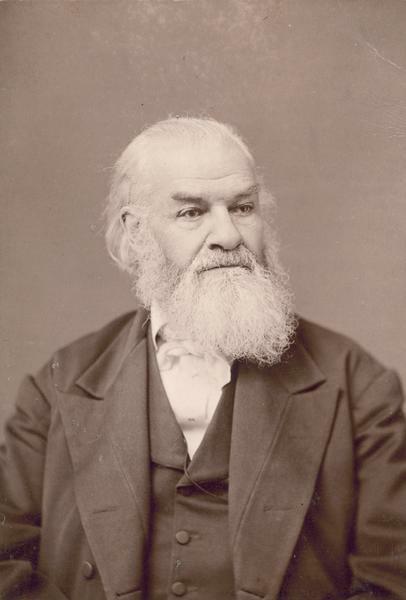 Studio portrait of Warren Chase with white beard and hair. He was the fourierite leader at Ceresco, home of the Wisconsin Phalanx. From Ancestry.com OneWorldTree: Warren Chase was born 5 Jan 1813 in Pittsfield, New Hampshire, to Simon and Huldah (Peaselee) Chase. He married Mary P White on 5 Jan 1837 in Newport, New Hampshire. They had 4 children: Ida, Lottie, Albert & Milton. Mary died 26 Nov 1875 and Warren died 25 Feb 1891, both in Cobden, Union County, Illinois. Chase himself--in his autobiography "The Life-Line of the Lone One"--says his mother was Susanna Durgin (1775-1818) an unmarried Pittsfield woman.